Turrets - there appear to be 3-4 different possible turrets accepted as options. 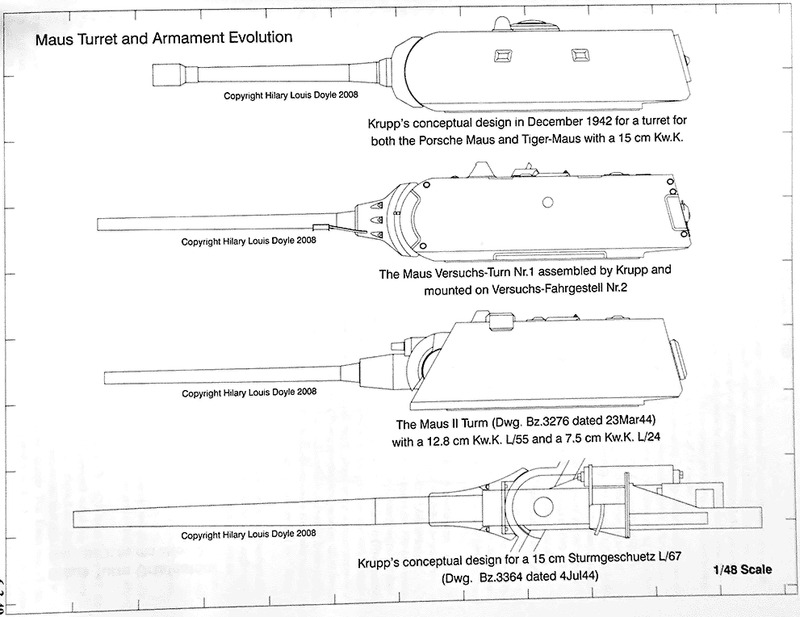 The Maus turret actually existed but I'm tempted by the E-100 specific turret. Could build both but which first? One piece or in sections? Would a more practical but less appealing version be better? Then off to Die Waffenkammer for cast. It's going to be a slow burn as the ankle biter is a bit of a time sink that can't be ignored! 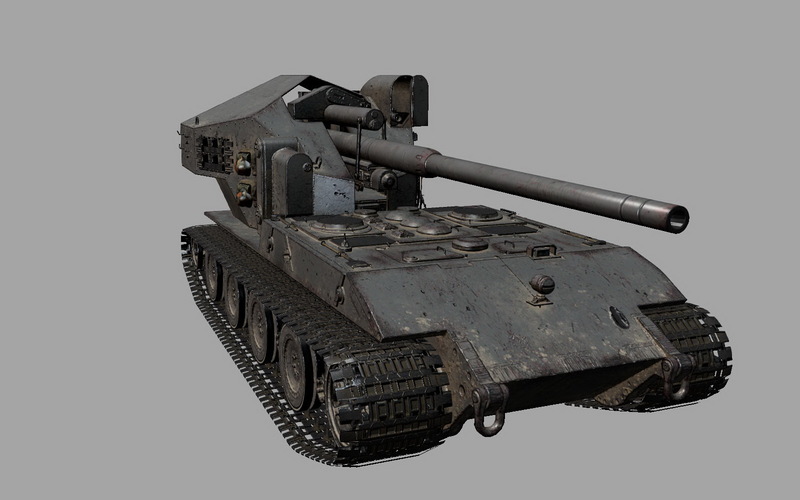 Of course the "Jagdpanther on steroids" version - it cannot be anything else! "Viel Feind - viel Ehr!" I'd prefer a muzzle brake too, just to further set it apart from the existing Maus on the market (the real E-100 is pictured as having a pepper pot style brake). There's also this (fictional) Panzer IV/ Tiger II style turret out there. Though for the base model I'd try and replicate the real vehicle as closely as possible, rather than going for made up variants. I've already said my piece about these. The side skirts on other German tanks tended to be "hung" on their mounts, so they could be knocked off by impacts. 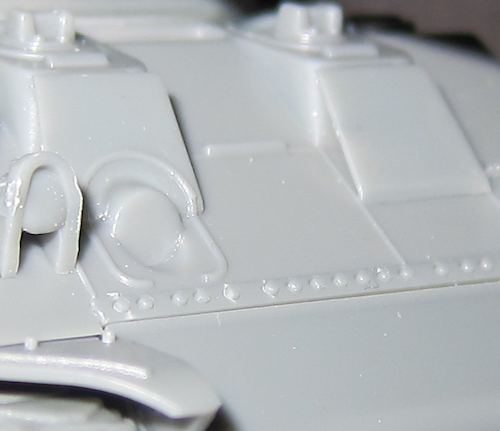 The ones on the E-100 appear to have much larger bolts. Unless someone's willing to show a deal of battle damage, its unlikely one of those things would just be knocked off. However, that's me coming from a "realistic" (my own viewpoint may be missing crucial information) standpoint, as opposed to rule of cool. Problematically, if you do them as single pieces then I'd imagine that they would not be entirely hollow. So if someone did want to remove sections, they'd have to cut out a load of resin, which I doubt most modellers would be willing to do. 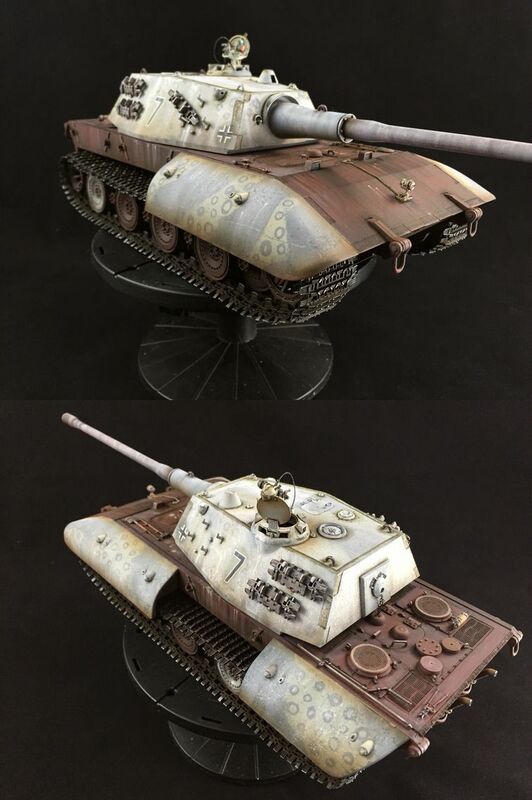 If you're going to make a dumb tank then you may as well make some stupid variants. The E-100 would have never worked. Though that's not to say that it was built by complete idiots. If you were to make the "Krokodil" then the vehicle would have to have had front torsion bars made out of Admantium. It could be explained away by changing the road wheel configuration, however I suspect that people would want to buy that exact Krokodil model which Queeg made, except in 1/56th, regardless of how silly it would be in real life. 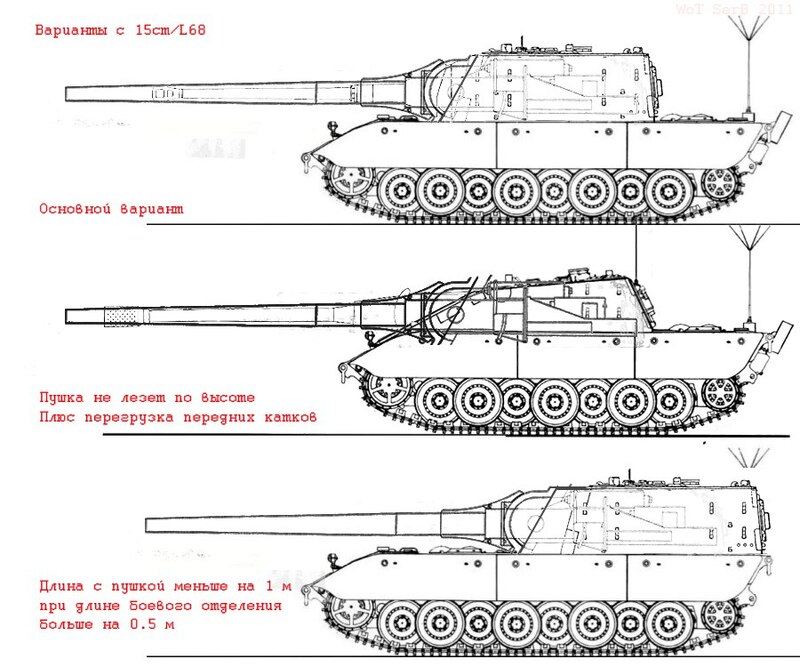 The variant with the rear casement fits late war designs on similar vehicles like the Jagdpanther II or Uralmash-1, and would be suitable for the torsion bar suspension. But its less iconic. 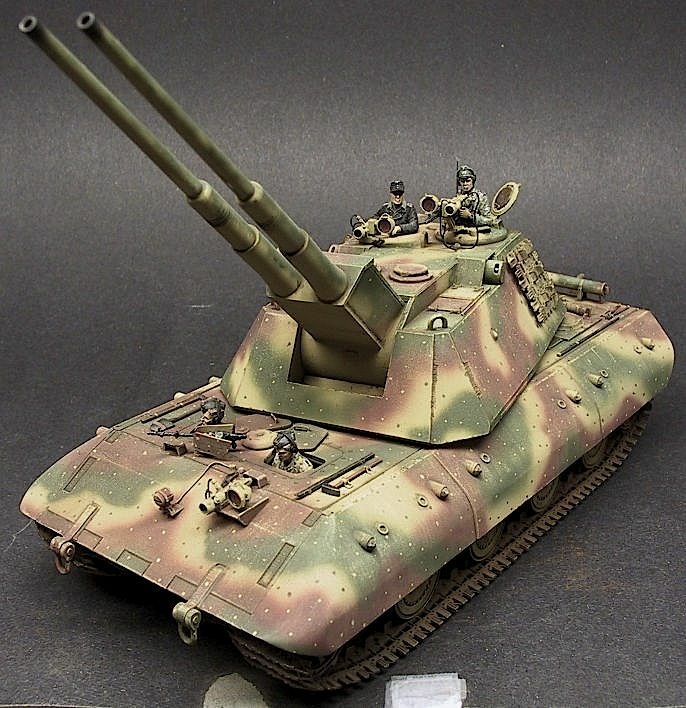 World of Tanks brings us these fictional (as in they say its real, but well, they're liars ) artillery carriers and if you want to do something strange. Ah, though again its my opinion that if you're going to do something at least try and have a basis in reality. I'd imagine there'd be more customers in this niche market looking for "real" paper panzers first, then silliness afterwards. Ignoring the StuGs, a Flakpanzer may be an option. Most of the ones which I've seen (uh, other than that one with 100 StG-44s as its main armament...) go for a Coelian style turret. Which from what I can tell uses the flat faced E-100 as a base if that makes things easier to build. As would it only require a new turret, rather than potentially changing the engine layout depending on where you place the tank destroyer's casement. Oh, and another note. With these E-series vehicles there could be the question of whether to go with a traditional engine or a gas turbine. Hmn, but that latter may be too niche. As would gas turbines be open to interpretation, whereas the real vehicle had an existing design (and so not recreating this could be divisive). So as a preference I'd like to see something which could have actually been built. If that means going for a "practical" design, then I'd be happy with that. 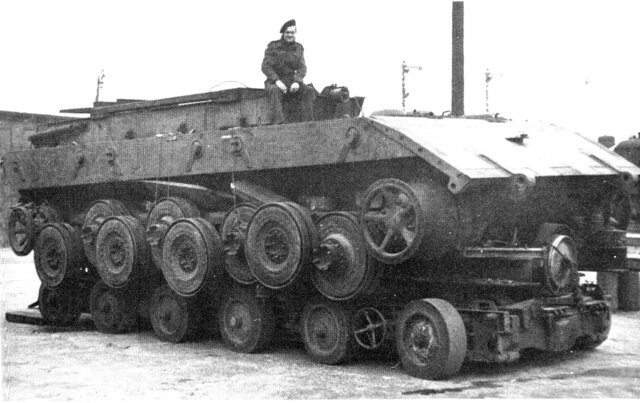 At least people could complain about it being too heavy or other accurate design faults the vehicles would have had, as opposed to griping about how the Krokodil would've driven over a small bump, ploughed itself into the ground with that front heavy gun and then broken its suspension. Though I'm slightly biased, in that I have a spare 3D printed E-100 there which I can turn into whichever variant you don't happen to do. "If you build it they will come..." (best wear something wipe down) I'd certainly be in the queue for one. As to the turret, it's quite confusing, it seems that the turret destined for the Maus was never really in the running (too big at 55 tons on its own), that the E-100 essentially was in competion with the Maus for the Bohemian corporal's attention & that he was definately of the bigger is better persuasion, meant it was doomed to lose out to its bigger rival. The Adlerwerke project probably would have recieved the proposed Maus II turret (the ugly slab-sided one like an upturned trough). 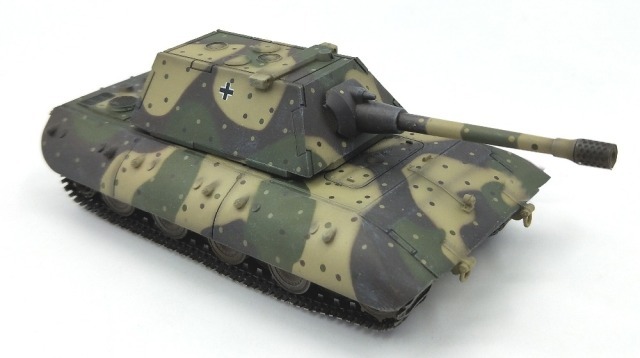 That said, the two kits familiar to scale modellers are the old Dragon & Trumpeter ones (Maus type turret & the fictional Mike Rinaldi designed one respectively, the Maus II design being on the new Amusing Hobby version) so you can argue the case for any of the three designs - though I'd like to put a vote in for the Rinaldi one - fictional I know, but it just looks the part & dispenses with the co-ax 7.5cm present on both the others. The skirts were designed as serious pieces of the overall armour package (between 30 & 70mm thick) & not the 5mm plate found in schurzen, hence the massive attachment bolts, to make them removeable for train transport - I'll be happy as long as each side is seperate & they're easy to section if you want to leave pieces off. One other thing is whether to include the extended tracks or not - the existing scale models all do, probably because the tracks found with the completed hull did. Again, they do look rather cool, but would they be a problem for you to produce? Yes, a 38D would also be nice (as all these monsters are huge point sinks game-wise & a small, cheap & reasonably effective paper panzer would be welcome). Skirts, rear bulkhead, basic hull, basic turret and detailed gun are all done. Then the suspension and undercarraige. Suspension should be rleatively straight forward as it's basically the same suspension and wheel units repeated over and over. Track links similar. Challenge wil be to get the sag right. Yes... but given I'm working at a larger scale I want to add in weld lines too which complicates things a bit. Does make it more interesting though. Just to check, is anyone aware of a kit in 1/56th scale which includes weld lines? Putting in weld seams is a nice touch, one of those details that you might not notice normally in comparitively small scale models, but once you do, their absence on lesser models is a bit disappointing (a bit like accurate panel lines). Just out of curiosity, are you going down the putty route for them, or plastic rod, softened with glue & shaped? OK, I may have typed that then immediately considered that some of the Die Waffenkammer vehicles in my collection have them. Still, for all those Soviet tanks out there, nasty welds seem oddly uncommon. They appear to me to be recessed between the plates so I'm going to put them as recessed. They are only small (0.2mm wide) but shoud still show up. Got a bit of time to draw.